There’s no need to go further with that conversation as I’m sure you have a fairly good idea of my answer (YES!). 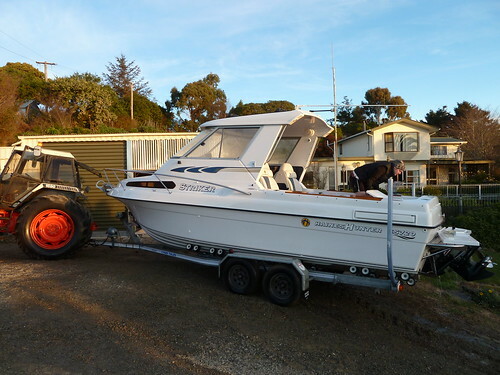 The drive up from Dunedin was about 40 minutes to Moeraki where Will has a house and more importantly keeps the boat. We quickly dropped off our gear and headed for the pub, there were five of us; Will, Megan, Hunter, Matt and myself. I won’t go too far into the details but suffice to say – as all good pub trips turn out, it was heavier than expected. Three words can immortalise that particular pub visit: gin, milk and raspberry. Morning arrived with two terrible hangovers for Hunter and Matt but the rest of us were not too bad. It was a slow start for a fishing trip but definitely fast enough. We fired up the barbeque and had a breakfast fit for kings; toast, bacon, eggs and fresh venison steaks supplied courtesy of Hunter’s recent deer trip. 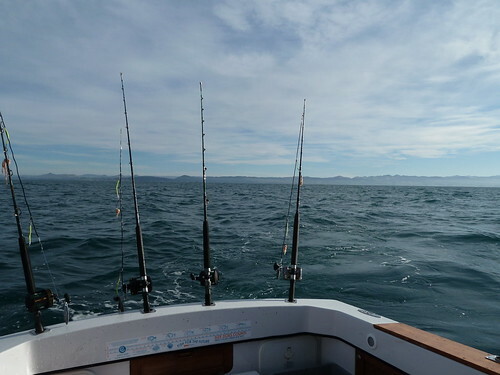 Once on the boat, we set off for a mark 5 miles offshore, got the rods tackled up and dropped the baits. The fishing was fast and furious every time the baits hit the bottom; if you didn’t have something on in less than 30 seconds then something was wrong with your tackle. The species encountered were red cod, jock stewart and blue cod – the prize. Everything went back except the appropriately sized blue cod. They are very good eating. I don’t have any pictures of the red cod or jock stewart unfortunately as they were just quickly unhooked and popped back. 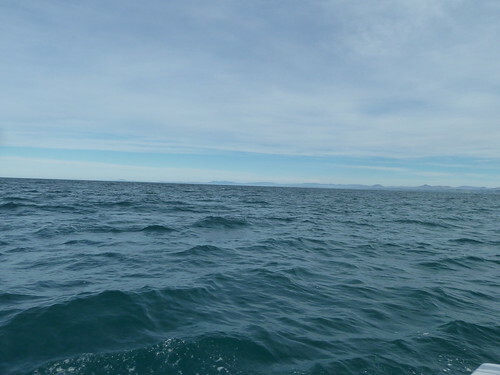 Fishing near Dunedin attracts Albatross! Dunedin (Otago peninsula) is home to the largest mainland breeding colony of Royal Albratross in the world hence the Albatross appearance. These magestic birds make a great spectacle whilst you are fishing. All in all we ended up with a great quantity of fish for the 20 minutes or so we spent fishing – we had to head back in due to how miserable the other boys were with their hangovers and additional sea sickness. They were hating life. 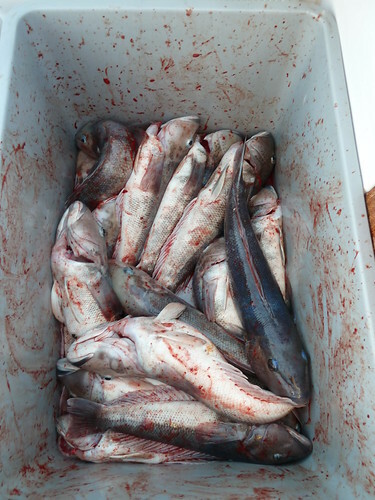 The fish were filleted and lunch was had with the same contents as breakfast with the addition of freshly caught blue cod. Amazingly delicious. 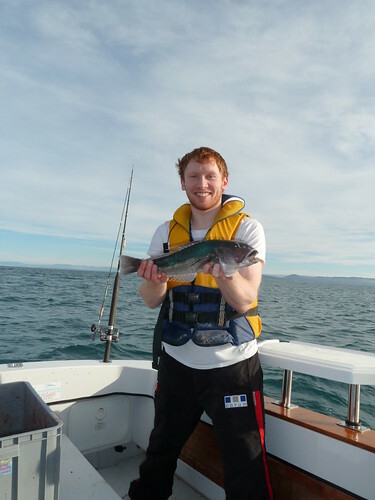 What a way to spend my final day in NZ, great fun, great banter, great fishing. 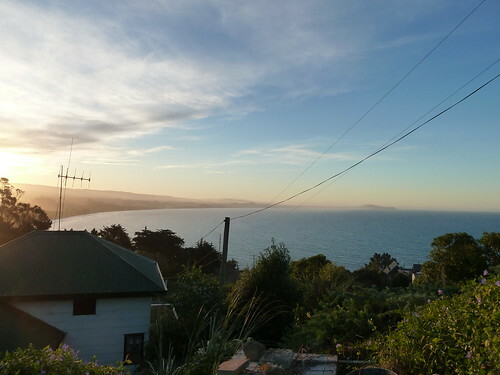 I’ll leave you with two photos of the end of the trip – one of the boat and Will and one of the view from Will’s place.